LeBron James is a remorseless assassin, his own secret society, the ultimate trump card, the French connection and the Spanish main, a beautiful mind, the spirit of the eagle, a healer of souls, a printer of money, the first banana republic, the last crusade, a certified doctor of mojo, an honorary doctor of funk, and an honest-to-god NBA champion. And that’s all I have to say about that. The NFL denied accusations that it covered up retractions by witnesses in its bounty investigation of the Saints. Oh, wait, that’s not all I have to say about that. It’s time you know the true story of LeBron. APRIL 1945. BERLIN, GERMANY, THE FUHRERBUNKER. Last days of WWII. Deep in the underground, Hitler and his men cackle as the war rages above them. “Nobody can ever find us!” they shout. Bad news, Hitler: LeBron shows up at the door. “Halt! You cannot enter!” says one Nazi, drawing his miniature Nazi gun. LeBron is unarmed, but it doesn’t matter. Spin move, hesitation, crossover. Slight elbow to the kidney, ref looks the other way. Bullets fly, but LeBron is too fast. Himmler tries to take a charge, but he’s in the restricted area. LeBron rages through 15 bunker rooms until he finds Hitler, trembling in a corner. 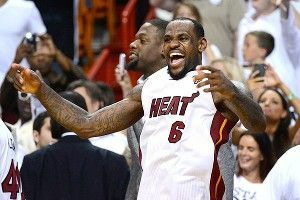 “Do the right thing!” says LeBron, tossing him a pistol. But Hitler is a coward, and decides to shoot LeBron instead. He smirks his Hitler smirk just before pulling the trigger. But LeBron knew his man, and had rigged it to shoot backward. No more Hitler. Eva Braun? Cheering despite herself. She rushes over, but LeBron brushes her aside. “I don’t date Nazis,” he says, breaking her spirit forever. On his way out, Himmler tries and fails to take another charge. Cristiano Ronaldo scored on a beautiful header to give Portugal a 1-0 win over the Czech Republic and a berth in the Euro 2012 semifinals. RUSSIA, PRESENT DAY. A park bench on the street. It’s a gloomy day, everyone wearing black coats, gray Soviet apartment buildings rising in the background, pigeons wandering up and down the street. One old man sits down beside another and peers at the Cyrillic headline on his paper. Translation: LeBron Wins Title. The man’s face stiffens. “No!” he whispers. “The man who finished Stalin. Only I remain alive from that awful day! Only I can tell the truth and revive the Soviet empire!” The first man slowly folds his paper. “It has been many years, Ivan Nikolayevich, and I see your famous memory has not faded with age.” He removes his mask: LEBRON F***ING JAMES. “Make this easy on me, would you, comrade?” he whispers. The man, stunned silent with fear, nods and makes himself die. In a profanity-laced tirade, Red Sox slugger David Ortiz criticized the media for stirring up drama in the Red Sox clubhouse. “It’s starting to become the shithole that it used to be,” he said. Meanwhile, the Sox completed a sweep of the Marlins with a 6-5 win. Rays reliever Joel Peralta was suspended for eight games after being caught with pine tar on the inside of his glove. In his final game before the suspension, Washington’s Danny Espinosa hit a game-winning two-run double off Peralta in the sixth, giving the Nationals a 5-2 win. Arizona beat Florida State 10-3 to advance to the finals of the College World Series, where they’ll meet South Carolina or Arkansas. ARKANSAS, 2005. The ivory-billed woodpecker, a.k.a. the Lord God Bird, is spotted for the first time since 1944. Everyone thought the bird was extinct, but the evidence is there — a heavenly apparition in the trees, swooping from branch to branch, glorious and rare. I don’t think I have to tell you who that bird was. Quintin Berry’s walk-off single in the 10th inning gave the Tigers a 2-1 win over the Cardinals. Oakland’s Yoenis Cespedes hit a walk-off three-run bomb to complete an unlikely three-game sweep of the Dodgers with a 4-1 win. it’s all working against us. Perhaps the dream is dead.” LeBron stares into the trees, does some mental math, and turns back to Roosevelt. “I’m going to need one shovel, and one James Harden.” When he receives both, he stands behind James Harden, mean-mugging him for a full decade, until a terrified Harden has dug the Panama Canal all by himself. When it officially opens, LeBron takes the first ride from the Atlantic to the Pacific on an old French crane boat called the Alexandre La Valley, on which he installs James Harden as the maidenhead. Bryce Harper told reporters that Under Armour will soon begin selling T-shirts bearing the phrase “That’s a clown question, bro,” after he said the words to a Toronto reporter last week.